It is about the time I usually get up. Well, about the time the alarm usually goes off. I am at work. Well – in the office, I am not quite working yet. The other great bookends to her trip were Mariner games. Not that she did not do anything other than go to Mariner games, but they seemed to be a significant part of the schedule. Dozens of innings, but not quite up to St. Louis standards for innings at a time. There was also a Sounder’s game, several meals out, friends, some movies, and the Great Seattle Wheel. The first Mariner game she attended was Felix Hernandez’s PERFECT GAME. 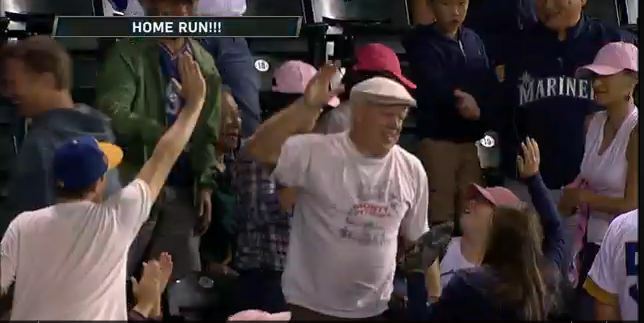 The last Mariner game she attended was also a Mariner win, and Carl caught (<– vide0) the game winning home run by Michael Saunders. Saunders actually hit two during the game. And I think every game she went to, the Mariner’s won. Carl pointed out that my record for the year is fairly dismal. Apparently Ashlan’s good luck overpowers my bad luck. And tonight is Felix’s game, his first since the Perfecto. People are all doing the “Felix” and posting pictures. 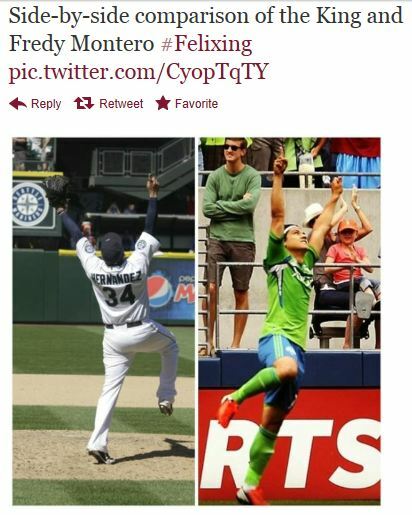 At the soccer game Fredy Montero did the Felix when he scored, although Ashlan disagrees on this point. But enough people accept the Fredy Felix, so he is throwing out the first pitch at the game tonight. Somehow, I don’t think the Cleveland Indians are all that excited about the Felix hoopla, and will try to dampen the building mood for the game. And now it is time for real work. This entry was posted on August 21, 2012 at 6:30 am and is filed under Uncategorized. You can follow any responses to this entry through the RSS 2.0 feed. You can skip to the end and leave a response. Pinging is currently not allowed. 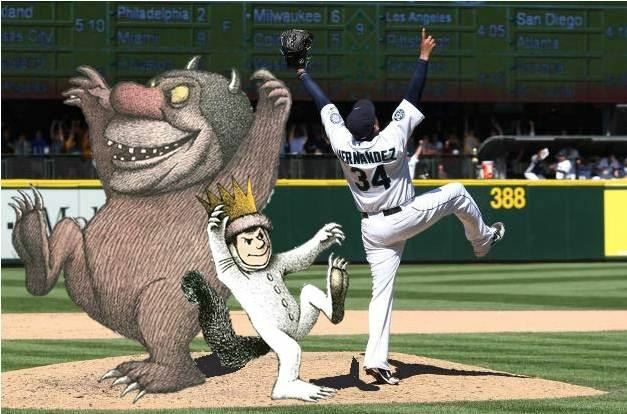 a) I like the Wild Thing Felix. b) I was on ESPN on Friday morning while attending the Western & Southern Tennis tournament. But no taped footage that I’m aware of. But my friend saw me, so that counts, right? All adds up to the 15 minutes we all get.